This is my go-to weekday lunch. I prepare it in the morning while my instant oatmeal is steeping; it takes about 8 minutes to put together. The recipe is flexible--you can change out the spinach for arugula or other dark greens, and the pepper and cabbage for other raw veggies you like. The quinoa adds protein, makes the salad more filling, gives me energy to get through the afternoon, and is incredibly delicious with the raw veggies. The red cabbage gives it a wonderful crunch, and the yellow pepper adds a touch of sweetness that plays off the bitter greens nicely. I make a pot of quinoa (1 cup quinoa + 2 cups water, no salt or oil) store it in the fridge, and then use it all week in this salad. 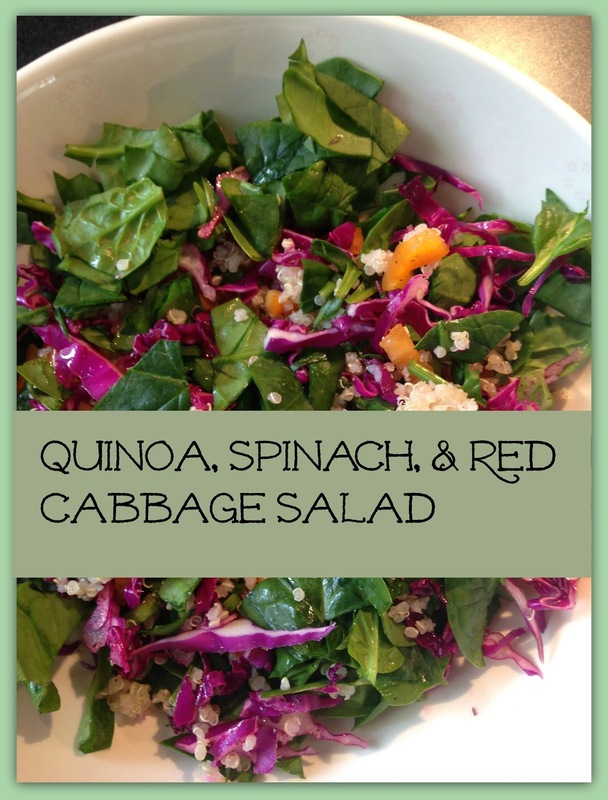 If you find that the salad isn't filling enough with only 1/2 cup quinoa, try a full cup or more. As I said, this recipe is very flexible! You can pretty much eat as much of this salad as you want without worrying about it dragging you down in the afternoon or making you gain weight, so feel free to double the portions.